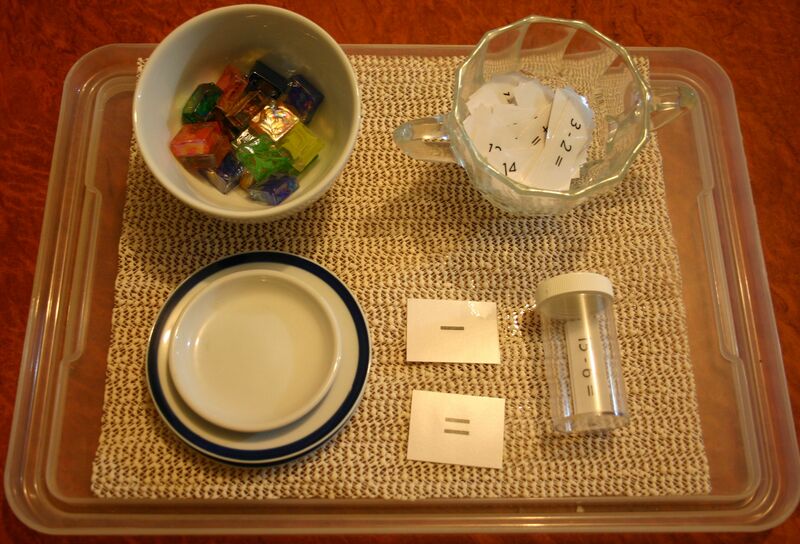 As with the addition trays, the subtraction facts that the child has already memorised are added to the screw-top jar to provide a visual indicator of their progress. Initially, the subtraction problems are split into sets; subtract 0, subtract 1, subtract 2 and so on and only 1 set is out at a time. Once they know the sets fairly well individually, we combine the lot, taking out the ones they have mastered and working on what is left. As with addition, learning to take away 0, 1, 2, and 10 is very easy, so starting with these gives the child a boost of confidence as they quickly master the first sets, filling that jar almost immediately. The subtraction materials are set out as above. The first and last plate are deliberately different from the second to provide a visual reminder of the relationship between the two. Subtraction must be done in order (numbers are not interchangeable as they are for addition and multiplication problems) so the child first counts out the number of objects they are starting with into the first plate. The smaller plate shows what has been taken away (removed, subtracted etc.) and what is left on the first plate is scooped over to the final plate, providing the answer. When the novelty of the plate tray wears off, I present the subtraction problems the child has not mastered in different formats to provide extra practise and revive interest in the activity. 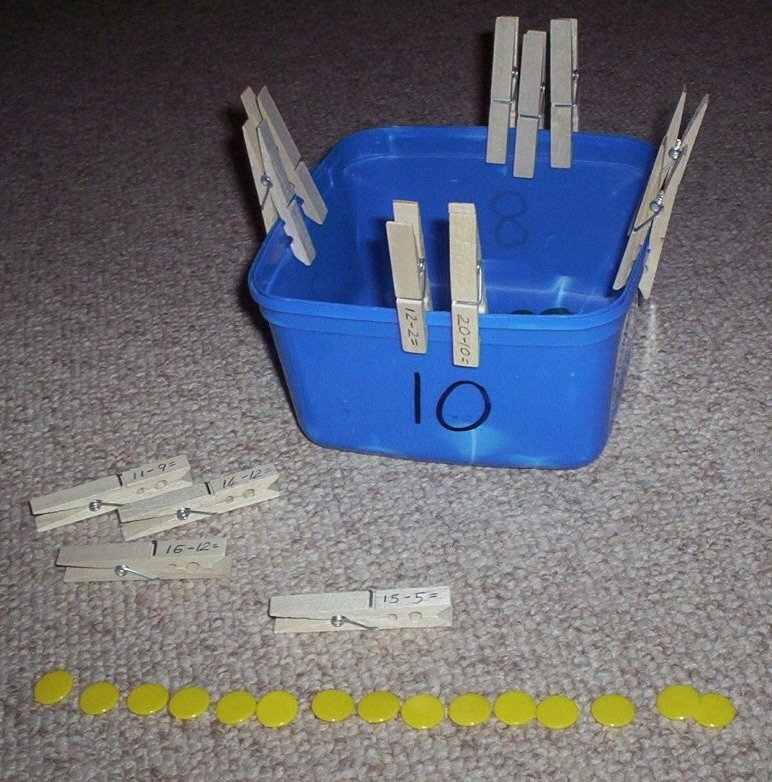 Subtraction problems on pegs are pegged onto the side of the container with the correct answer. The counters are the manipulative. Provide more than one container or a multi-sided container if you want a broader scope of answers. These subtraction cards are a set from Kmart that we were given. A dry erase marker can be used to mark the answers on the cards. The “glass” slippers are wedding favours. My girls love this activity just because they get to handle the tiny shoes! An attractive material will draw them in every time. Add an interesting story to the tray (How many spare slippers Cinderella keeps in her closet?) and you will have them begging to have a go. 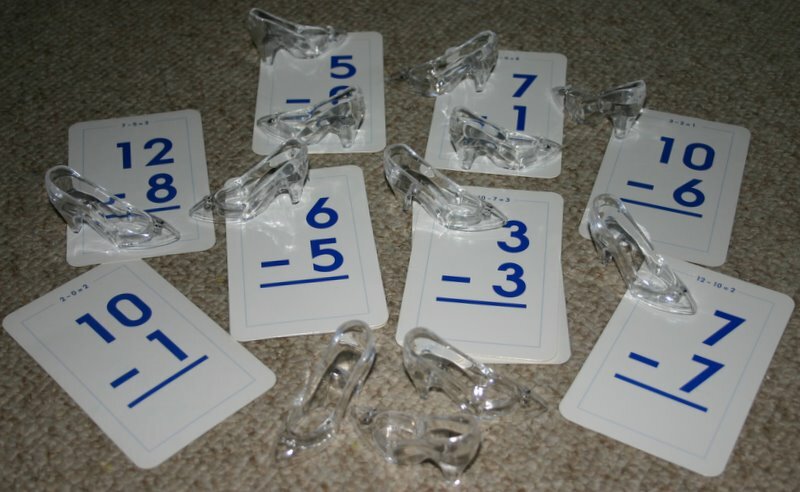 The same subtraction card set paired with any manipulative of your choice gives you a fresh “new” activity. This time the children were doing the problems in their heads and finding the correct bead string for the answers – good for those who find writing a chore. 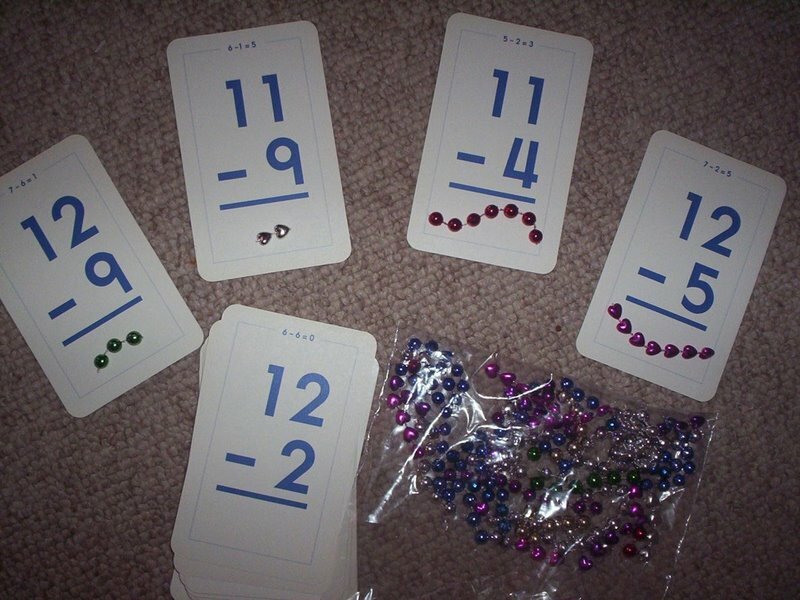 There is exactly the right number of bead strings so if the strings do not match the last cards this alerts the child to an error that they can find and address. It doesn’t take too much extra time or effort to keep learning engaging and enjoyable. Have a look around your house or check out your local discount variety store for a couple of different kinds of manipulatives and you are on your way.